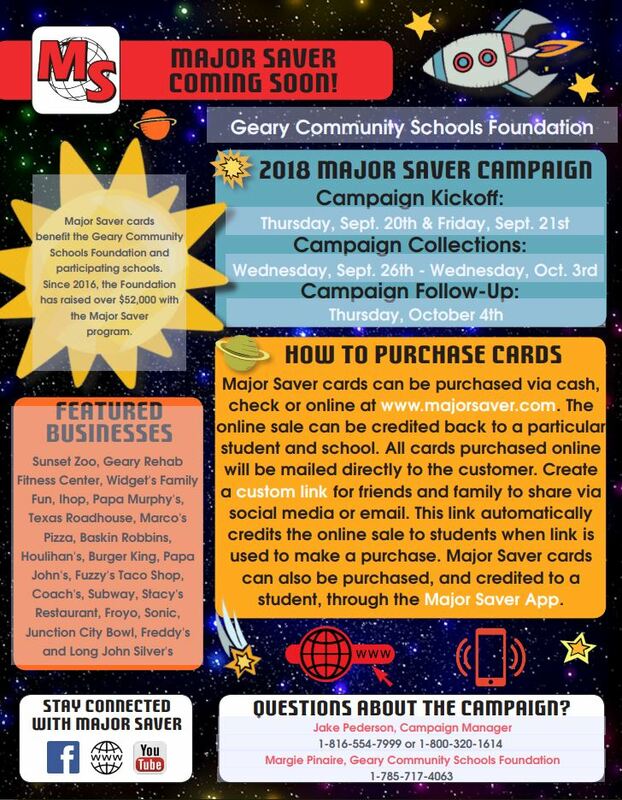 Major Saver is excited to once again partner with the Geary Community School Foundation and schools this year. The Major Saver Program connects our community, businesses, schools, and students in an easy-to-manage fundraising package. Major Saver cards can be purchased via cash, check or online at www.majorsaver.com. The online sale can be credited back to a particular student and school. All cards purchased online will be mailed directly to the customer. Create a custom link for friends and family to share via social media or email. This link automatically credits the online sale to students when the link is used to make a purchase. Major Saver cards can also be purchased and credited to a student through the Major Saver App. August 16, 2018 USD 475 Comments Off on Welcome Kindergarteners!